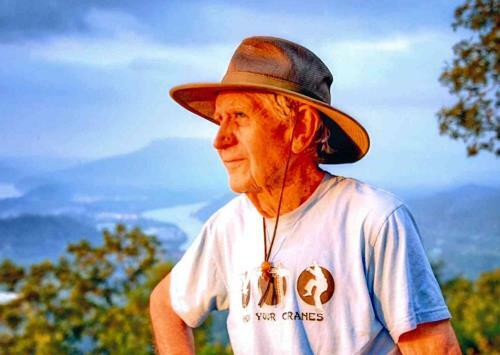 Sam H. Powell, 86, of Signal Mountain, who devoted his whole life to the building of hiking trails, conservation and improvement of the environment, died on February 8, 2019. He was married to the late Emilie Ervin Powell for 61 years. A native of Tarpon Springs, Fl., he was the son of the late William Marshall Powell and Margaret Harvey Bomar Powell. He grew up in Florida and Haley, Tn., and served in the U.S. Army from 1953-54 during the Korean War. He received a bachelor’s degree from the University of Tennessee at Knoxville (UTK) in 1958. He worked his entire life in the electric utility industry, starting as a lineman with the Tennessee Valley Authority (TVA) in West Tennessee and Kentucky in 1951. Following graduation from UTK, he came to Chattanooga in 1959 to join TVA where he worked 40 years, retiring in 1994 as manager of co-generation and small power production. He was active in the UT Alumni Association for many years, serving as president of the Hamilton County Chapter, was a two-term member of the General Alumni Board of Governors and in the 1960s led a group of UT Alumni in Hamilton County to contact Dr. Andrew Holt, president of the University of Tennessee (UT), to ask that UT establish a campus in Chattanooga. Working with Third District legislators and Paul Kinser, the governor’s representative in Hamilton County, the group was able to get the University of Chattanooga to become the University of Tennessee at Chattanooga in 1968. Sam served a term on the UTC Chancellor’s Roundtable. Sam was a member of the Tennessee Conservation Commission for five terms (15 years), he was a founding member of the Cumberland Trail, which runs from Signal Mountain 300 miles across the state to Cumberland Gap. This trail continues to grow with additional parts that spin off to connect various parks. In addition, he was chairman of the Cumberland Trail Conference, and was a founding member and longtime director of the Tennessee River Gorge Trust. Preservation of the environment was very important to Sam and in addition to the many other groups he was active in he served on the Tennessee State Committee on Off-Highway Vehicles and the Tennessee Riverpark Advisory Committee which oversaw Hamilton County Parks for many years. On Signal Mountain he served as chairman of the Parks Board, was an environmental monitor for the construction of Shackleford Ridge Recreational Park, obtained grants and led development of four miles of hiking trails within Shackleford Ridge and directed the building of a trail system connecting Green Gorge with Rainbow Lake and the Cumberland Trail. Sam spearheaded the building of two bridges in the Green Gorge section of the Mountain. Other groups Sam was active in included: the Chattanooga Engineers Club, the Association of Energy Engineers (International) and the International Cogeneration Society. He served as president of the Chattanooga Audubon Society for two years and for 16 years was Scoutmaster to Boy Scout Troop 130 on Signal Mountain. He even assisted the Signal Mountain Police department as an auxiliary officer for many years. Awards given to Sam included: the Tennessee Department of Environment and Conservation’s Lifetime Environment/Conservation Achievement Award for 2002, the Tennessee Governor’s Greenways and Trails Award for 1999, the Cumberland Trail Award for 1998, the Chattanooga Engineers Club People-To-People Award for 1990, the Tennessee Division of Forestry Friend of Forestry Award for 1986, the Signal Mountain Junior High Father-of-the-Year Award for 1982, the Tennessee Trails Association Trails award for 1980 and the Boy Scouts of America Award of Merit and Eagle Scout. In honor of Sam’s dedication to his community, the town of Signal Mountain dedicated “Sam Powell Trail” as a new road through Shackleford Ridge Park. It is now the official address for Signal Mountain Middle High School. He is survived by his daughter Julia Powell Rafter, her husband Michael and son Jaden Powell Rafter of Milton, Georgia; sisters-in-law Nancy Ervin Powell, Wartrace, TN, and Susan Ervin Callis, Findlay, Ohio; brother-in-law Nat Ervin and his wife Bonnie of Ashland City, TN; and Judy Ervin (wife of brother-in-law Kimery Ervin), Columbia, TN. He is predeceased by sisters Marie Powell Bragg, Tullahoma, TN, and Rose Powell Clinard, Shelbyville, TN; brother Robert Stone Powell; and brothers-in-law Larry Callis, Carey, Ohio and Kimery Ervin, Columbia, TN. A Celebration of Life service will be held at 12 p.m. (noon) on Tuesday, Feb. 12, in the chapel of Hamilton Funeral Home with Brother Richard Floyd officiating. Military honors will conclude the service. His family will receive friends from 4–7 p.m. on Monday, Feb. 11, and from 11 a.m. – 12 p.m. (noon) on Tuesday, Feb. 12, at the funeral home prior to the service. In lieu of flowers, please consider contributions to one of these charities that were all very important to Sam: Cumberland Trails Conference, The Land Trust for Tennessee or the Tennessee River Gorge Trust. You can learn more about these organizations, and where to donate, through their websites. We invite you to send a message of condolence and view the Powell family guestbook at www.HamiltonFuneralOptions.com.